Do you like to raise your ring level? Have items ''2x COUPLE POINT item'' accumulated and do not know what to do with them? 1) Collect at least 25 trials from the item ''2x COUPLE POINT item'': These items can be purchased at the Shopping Mall (items tab) or you may be lucky enough to win them at the Gacha Machine of the Couple Garden. Important Note: Items must be accumulated in both the couple's accounts. 2) Activate the 25 trials (Shopping Mall > My Items). 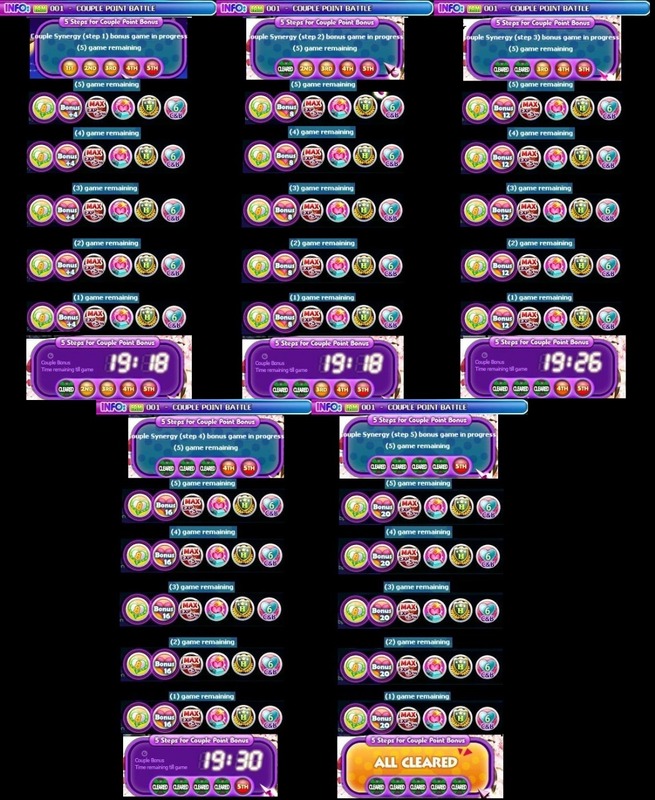 3) Create a room with Couple Point Battle mode (because it is a mode that gives 6 couple points per round, much better than block beat that the hearts are random and dependent on luck maybe ) and play with at least +1 couple that has ring (you can not play that mode with only your partner). Important Note: You and your partner have to win every round of the match. Important note: There are 5 stages of Couple Point Bonus (Stage 1, 2, 3, 4 and 5) and each stage comprises 5 matches => Bonus 1: 5 matches; Bonus 2: +5 matches; Bonus 3: +5 matches and so on, totaling 25 matches. Important Note:You and your partner can not have played together yet, so you can enjoy the 25 matches that the 5 Couple Point Bonus contemplates. Important Note: Do not play in the ''Bonus Time'' to not spend the item that is already activated, because you can not deactivate it. 4) When you and your partner activate the item ''2x COUPLE POINT item'' together (on both accounts), the hearts that get by playing together (which would normally be 2) plus the bonus that you are currently playing are doubled twice (because both are with the item on), with the exception of the 6 couple points that the mode couple battle party gives (those do not double). Follow a photo/montage with all the bonuses for a better visualization and understanding. Final considerations: We've already tested this item in different modes and we've come to the conclusion that this is the best way to optimize this item and to get more hearts. So for those who like to raise their ring level (like us) this is a cool alternative not only for raising hearts, but also for practicing this mode and spending more time with your partner. Any questions just write below. See you on the dance floors!